Filet mignon has distinction -- and not just as an elegant cut of beef. Mignon translates as "dainty," and classically, filet mignon refers to medallions cut from the tapered end of the tenderloin. However, "filet mignon" has come to represent any steak cut from the tenderloin. The only difference between filets from the tapered end of the tenderloin and those from the thicker portion is cooking time. True filet mignon, which measure about 3/4 inch thick, cook to medium rare in about five minutes, whereas thick filets take a minute or two longer for every 1/2 inch of additional thickness. Season the filets to taste and let them sit at room temperature for about 10 minutes. 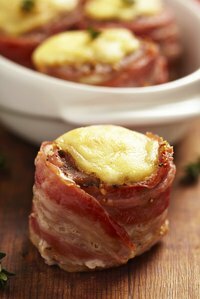 If desired, snugly wrap a slice of bacon around each filet and secure it using a toothpick. Heat a couple tablespoons of vegetable oil or a combination of butter and vegetable oil in a heavy-bottomed saute pan on the stove over medium heat. Lay the filets broad-side down in the pan when you see the oil shimmer. Sear the filets until golden brown, about 3 minutes, then turn them over. Sear the other side for about 2 minutes then remove the bacon if you used it. If cooking filets thicker than 3/4 inch thick, add about 1 minute to each side for every 1/2 inch of additional thickness. Hold the fillet using tongs and sear the sides. Check for doneness with an instant-read thermometer: 125 degrees Fahrenheit for rare, 135 F for medium-rare, 145 F for medium. Take the filets out of the pan and let them rest on a plate, loosely covered with foil, for 3 or 4 minutes before serving. The internal temperature will continue to rise a degree or two due to carryover cooking. You can make a quick pan sauce by deglazing the pan with a couple tablespoons of stock while the filets rest. Spoon the sauce over the filets to serve. The U.S. Department of Agriculture advises cooking beef to a minimum internal temperature of 145 degrees Fahrenheit.